Daughter Holcombe was born circa 1785. She was the daughter of Joseph Holcombe and Sarah Ford. Daughter Holcombe died in 1798. Chester Parsons was born on 20 September 1797 at Worthington, MA. He married Betsey Holcombe, daughter of Joseph Holcombe and Sarah Ford. Chester Parsons died on 22 March 1852 at Worthington, MA, at age 54. Amasa Parsons was born on 20 November 1827 at Worthington, MA. He was the son of Chester Parsons and Betsey Holcombe. Infant Parsons was born on 17 April 1827. Infant Parsons died on 18 April 1827. Infant Parsons was the child of Chester Parsons and Betsey Holcombe. Joseph H. Parsons was born on 12 August 1831. He was the son of Chester Parsons and Betsey Holcombe. Lewis E. Parsons was born on 16 January 1833. He was the son of Chester Parsons and Betsey Holcombe. Lewis E. Parsons died on 4 November 1854 at age 21. Charles H. Parsons was born on 3 August 1835. He was the son of Chester Parsons and Betsey Holcombe. Alvah Parsons was born on 9 January 1838. He was the son of Chester Parsons and Betsey Holcombe. Julius A. Hayden was born circa 1862 at GA.1 He was the son of Judge Julius A. Hayden and Harriet E. Cone.1 Julius A. Hayden married Emma Louise Mattson, daughter of Edith R. (? ), circa 1906.2 Julius A. Hayden died on 29 April 1932 at Germantown, PA. He was buried at Oakland Cemetery, Atlanta, GA; Block 8, Lot 305. Juilus and Emma were enumerated in the 1910 Washington DC federal census, but the online image was nearly undecipherable. They had been married 3 years and had two children. Julius was enumerated in the 1920 Philadelphia, Philadelphia Co., PA, federal census, ED 309, ward 15, page 5B. He was 54, a clerk for the US Govt. and his marital status is unclear; Emma was not enumerated. Children in the household were Julius 11, Edith 9, Ruben 7, John M. 5, and Mary E. 2. Julius was enumerated in the 1930 Philadelphia, Philadelphia Co., PA, federal census, ED 671; He was widowed, 66. Also in the household were son Julius A. Jr. 21, Edith R. 19, Ruben C. 17, Mary E. 12, mother-in-law Edith R. Mattson 69, and uncle Joseph P. Camp, 74. Reuben Cone Hayden was born on 1 January 1871 at GA; GS. He was the son of Judge Julius A. Hayden and Harriet E. Cone. 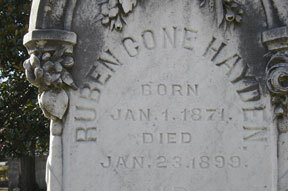 Reuben Cone Hayden died on 23 January 1899 at age 28; GS. He was buried at Oakland Cemetery, Atlanta, GA; Block 8, Lot 305. Mr. Reuben C. Hayden, one of the best known and most popular young men in the city, died at 2 o'clock this morning at the residence of his sister, Mrs. Harry H. Hightower, 167 West Peachtree street. Mr. Hayden has been ill since January 14th with typhoid pneumonia, and though it was known for some days that his condition was critical, his death has proved a severe shock to his relatives and friends. His mother, Mrs. J. A. Hayden; his brother, Julius A. Hayden; his sisters, Mrs. A. M. Thrasher of Sanford, Florida; Mrs. E. H. Phillips, Mrs. Geo W. Harrison, Mrs. Harry H. Hightower, Mrs. R. C. Whitner, of Atlanta, and Mrs. John G. Williams of Washington, D. C. Mrs. Williams is at present in Atlanta on a visit, and Mrs. Thrasher has been telegraphed for. Mr. Hayden was 28 years old. His father, Judge J. A. Hayden, was one of the most prominent men in Atlanta during the early days of the city. The young man was a member of the insurance firm of John A. Bowie & Co., and a conspicuous figure in social as well as business affairs. He was vice president of the Young Men's Athletic Club. and a member of the Capital City Club, and the Piedmont Driving Club. The funeral services will take place at 2 o'clock tomorrow afternoon at the residence of Mrs. Hightower. The interment will be at Oakland. The following friends of Mr. Hayden will act as pallbearers: A.J. Orme, M. M. Jackson, E. C. McCune, R. F. Shedden, Frank M. Inman, Charles Matthews, jr., W. P. Hill, and Ulric S. Atkinson. The effect the death of Mr. Hayden will have on the large number of suits he he had filed to recover an eighteenth interest in a vast amount of valuable property is not yet known. A gentleman who is very close to the members of the family said this morning that he thought Mr. Hayden's death would end all of the litigation. "The members of the family were averse to the litigation," he said, "and I know they have taken absolutely no interest in it. Reuben has been criticized for his conduct in it, but it was not his desire to oppress any one. Shortly before his death he gave quit claim deeds to about thirty poor people whose property was involved. They went to him for the purpose of making settlements, but he declined to take their money. "From the view that his relatives have previously taken, I would think his death would put a stop to all of the suits which are still pending, but I do not speak authoritatively. If he made any reference to this litigation during his illness I have not heard of it." "The effect will be to delay the litigation, that is all. An administrator will be appointed, and the suits will be continued in his name. A great many of the cases have already been settled and there are not so many remaining. I suppose there are about 100 left." When asked if there was any likelihood of the relatives deciding to stop the suits Judge Dorsey said he did not know, but it would be possible to dismiss the suits upon the payments of the costs already incurred. The interest which Mr. Hayden had in the litigation was derived from a marriage contract made between his grandmother, Mrs. Lucinda Cone, and Judge Underwood. The contract provided that Mrs. Underwood should have a life estate in the property and at her death it should go to her daughter, Mrs. J. A. Hayden, and to Mrs. Hayden's children. As one of the children, Reuben C. Hayden was held to be entitled to 1-18th of all of the property involved. Lucie Minerva Hayden was born on 9 September 1851 at GA.1 She was the daughter of Judge Julius A. Hayden and Harriet E. Cone. Lucie Minerva Hayden married George Washington Harrison, son of Hon. George Warren Harrison and Frances West, on 29 April 1874 at Atlanta, GA. Lucie Minerva Hayden died on 31 October 1935 at age 84. She was buried at Oakland Cemetery, Atlanta, GA; Block 8, Lot 305. George and Lucy were enumerated in the 1900 Atlanta, Fulton Co., GA, federal census. He was a publisher, age 51, she was 52. Children in the household wee Lucy H. 19, and George W. 15. George W. and Lucy H. were enumerated in the 1910 Ward 8, Atlanta, Fulton Co., GA, federal census. He was a publisher of law books, age 61, she was 58. The only children in the household were Lucy 28, and George W. Jr. 25, who was also a publisher of law books. George and Lucy were enumerated in the 1920 Atlanta, Fulton Co., GA, federal census, ED 125. He was a publisher. The only child enumerated was George, 34. George W. and Lucy H. were enumerated in the 1930 Atlanta, Fulton Co., GA, federal census, ED 108, 1654 Peachtree St. He was 81, she was 78. The only child in the household was son George W. Jr. 45. George Washington Harrison was born on 31 March 1849 at Randolph Co., GA. He was the son of Hon. George Warren Harrison and Frances West. George Washington Harrison married Lucie Minerva Hayden, daughter of Judge Julius A. Hayden and Harriet E. Cone, on 29 April 1874 at Atlanta, GA. George Washington Harrison was buried at Oakland Cemetery, Atlanta, GA; Block 8, Lot 305. Among the many public-spirited business men of Atlanta to whose labors and enterprise the world-wide fame of this city is largely due, few occupy a more conspicuous position and deserve more praise than the subject of this sketch, Mr. George W. Harrison, general manager of the Franklin Publishing House. The accompanying cut is an excellent likeness of this well-known gentleman. He is a member of a distinguished Georgia family. His father, Hon. George Warren Harrison, for years represented Randolph county in the general assembly, and was secretary of state during the administration of Governor Towns, being succeeded after his death by Hon. 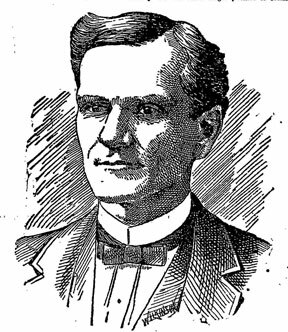 N. C. Barnett. His elder brother, Hon. Z. B. Harrison, is the popular and efficient clerk of the supreme court, which office he has filled with distinction for many years uninterruptedly, and the important duties of which he is still discharging with marked ability. Mr. George W. Harrison is a living example of what energy, self-reliance and a broad-minded business policy will accomplish. His duties are manifold and exacting, demanding a clear head, decision of character and versatility of talent; yet everything is so thoroughly systematized that not the slightest jar occurs in the management of his extensive business. His duties include those of general manager of the Franklin Publishing House, the most extensive business of the kind in the south, and whose splendid building on Ivy street adjoining Edgewood avenue, is one of the architectural ornaments of our city. He is also and has been for a number of years, state printer, an office of honor and great responsibility, in which he has given unqualified satisfaction, as attested by the state officials from his Excellency through all the departments, whose confidence and friendship is unquestioned. During the trying times of reconstruction Mr. Harrison was in the executive department with that grand man, Charles J. Jenkins, at whose request he remained in office until the government was removed to Atlanta. He is also manager of The Southern Cultivator, the oldest and most popular agricultural monthly in the south. He is also manager of the Southern Architect Publishing Company, which issues the only architectural and building magazine in the southern states. Mr. Harrison has always taken deep interest in everything calculated to promote the prosperity of the country, and is an influential participant in enterprises whose object is to push the south to the front. He is a life member of the Georgia State Agricultural Society, and by his liberality and public spirit has well earned the title of "the farmers' friend," bestowed on him at one of our agricultural conventions. It was to his individual efforts and liberal pecuniary aid, that the recent road congress held in this city as well as the direct trade convention, both of which were most important events, proved so largely successful. Both of these movement for the best interests of Georgia and the south have now assumed the grand proportions of a national movement. A large number of employees are engaged in the various departments of the extensive establishment under his control and the amount of the annual payroll makes a large contribution to the material wealth of the community, especially disseminated among the worthy wage-workers of our city. In religious and philanthropic work also he does his full share and no public charity has ever found him unwilling to assist. He is a consistent member of the First Presbyterian church, and is the efficient chairman of its board of deacons. He has never sought political or social distinction, preferring to do his duty in the quiet walks of life, and finding his highest and purest pleasures in the home-circle. On his accomplished wife, who is a daughter of the late Judge Julius A. Hayden, and on his two lovely children, he lavishes the wealth of his affection finding in them and in their devoted love, that true contentment which is the crown of a well-spent life, and in exchange for which all the gold and silver and honors of this world would count as nothing. His career and the results of it serve as an excellent object lesson to the young men of our day. If they will aim high, concentrate their efforts, avoid idleness and fashionable dissipation and by pure and upright living command the respect of their fellow men, success is certain in whatever they undertake, and their lives will be a source of blessing to themselves and to the world. Nine-tenths of the disgraceful failures of today are due to the violation of these essential elements of success which we have just mentioned, and the exercise of which have given the subject of this sketch the prominent position he occupies among the successful business men of this city. Julius Hayden was born on 18 September 1838 at Candor, Tioga Co., NY. He was the son of Sidney Hayden and Florilla Miller. [S241] Jabez Haskell Hayden, Hayden Family, Page 183, Item 571. Algernon Sidney Hayden was born on 5 February 1843 at Athens, Bradford Co., PA. He was the son of Sidney Hayden and Florilla Miller. Algernon Sidney Hayden died on 23 May 1843. Albert Hayden was born on 19 March 1844 at Athens, Bradford Co., PA. He was the son of Sidney Hayden and Florilla Miller. Charles Hayden was born on 25 June 1846 at Athens, Bradford Co., PA. He was the son of Sidney Hayden and Florilla Miller. Ruth Hayden was born on 11 September 1848 at Athens, Bradford Co., PA. She was the daughter of Sidney Hayden and Florilla Miller. Sidney Hayden was born on 15 February 1857 at Athens, Bradford Co., PA. He was the son of Sidney Hayden and Florilla Miller. Charlotte L. Hayden was born on 25 October 1824. She was the daughter of Ransom Hayden. Charles L. Austin was born on 16 September 1848. He was the son of Thomas J. Austin and Charlotte L. Hayden. Nellie Louisa Austin was born on 4 May 1853. She was the daughter of Thomas J. Austin and Charlotte L. Hayden. L. Corintha Austin was born on 4 September 1861. She was the daughter of Thomas J. Austin and Charlotte L. Hayden. In 1882 was living in Laporte, Black Hawk Co., IA. Osman M. Hayden was born on 29 December 1826. He was the son of Ransom Hayden. Sarah J. Hayden was born on 1 October 1832. She was the daughter of Ransom Hayden. "I raised a company for the 16th Regt. Conn. vols., which contained the sons of four ministers, and two young men who had fitted themselves for lawyers. All the company were young men of the highest standing. I was wounded at the battle of Antietam, and as my wounds did not heal was discharged the following January. Our regiment left Hartford, Aug. 28, 1862. We had a colonel who sacrificed his regiment in less than four weeks and accomplished nothing." Nathaniel Hayden Jabez Hayden. [S241] Jabez Haskell Hayden, Hayden Family, Page 249, Item 580. [S241] Jabez Haskell Hayden, Hayden Family, Item 580. Georgiana Hayden was born on 5 May 1837. She was the daughter of Ransom Hayden. Henry Hayden was born circa 1840. He was the son of Maj. Nathaniel Hayden and Sarah Root. Henry Hayden died at Old Seminary, Nashville, TN. Laura Hayden was the daughter of Maj. Nathaniel Hayden and Sarah Root. Laura Hayden died in 1885 at St. Louis, St. Louis Co., MO. Sarah Ann Cook married Austin Hayden, son of Col. Nathaniel Hayden and Sally Ransom. Sarah Ann Cook died circa 1840. Ida Hayden was born circa 1854. She was the daughter of Addison Hayden and Harriet Pierson. Sylvia Malinda Hayden was born on 4 February 1841 at Jefferson, Jefferson Co., WI. She was the daughter of Gay Hayden and Melinda Sexton. Mary Hayden was born in February 1851 at Jefferson, Jefferson Co., WI. She was the daughter of Gay Hayden and Jane Bean. Marion Hayden was born in February 1851 at Jefferson, Jefferson Co., WI. She was the daughter of Gay Hayden and Jane Bean.